For the third film in the franchise that started in 2008, we head to 2018’s The Cloverfield Paradox. An international crew aboard the Cloverfield Space Station assembles to test a new particle accelerator that may help solve an energy crisis on the Earth. However, this experiment goes awry and the device instead opens a portal to a parallel dimension. The crew finds an alternate Cloverfield Station there and they need to work to find a way back to their own reality. Though I referred to the Cloverfield series as a “franchise”, in truth the three movies bear little real connection. 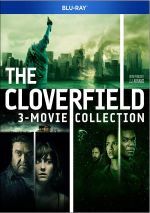 Neither 2016’s 10 Cloverfield Lane nor Paradox act as true sequels to 2008’s Cloverfield, so they all relate more as part of a semi-related anthology than anything else. 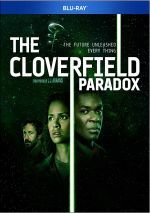 Indeed, neither Lane nor Paradox began life as Cloverfield movies. Instead, they came from independent properties that simply got reworked to mesh with the Cloverfield universe in their loosey-goosey ways. 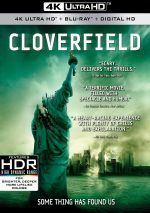 In the case of Lane, that choice seemed moderately clever, but now that we’ve gotten to the third movie, the Cloverfield name starts to feel more like a gimmick than something that makes inherent sense. Lane gave us a tangential link to the first film, and Paradox seems even less attached to the series. If I ignore potential complaints about the nature of the franchise, does Paradox provide a satisfying cinematic experience? Nope – it borrows liberally from other films and never creates a compelling sense of its own identity. One can easily find ample “influence” from 1979’s Alien, and in one scene, 1982’s The Thing gets ripped off. Paradox doesn’t execute these with a sense of a wink or homage, so instead, it simply steals. If Paradox managed to form some sense of excitement or intrigue, this plagiarism might bother me less, but the film’s inherent lack of thrills saps its potential. Sure, the movie comes with a plot that boast dramatic events, but these come out in such a rote, trite manner that they never go anywhere. As such, Paradox plods when it should delight. It follows a predictable path that never deviates from norms set by earlier movies, and these choices render the story inert. We do find a nice cast here, as quality actors like Gugu Mbatha-Raw, David Oyelowo, Daniel Brühl, Chris O’Dowd and others appear. Each and every one brings us perfectly acceptable work, but none of them manage to elevate their cliché parts. Because I liked the first two Cloverfield films, I hoped Paradox would offer another winner. Unfortunately, it gives us a tired, worn-out tale with nothing new to bring to the table. The Cloverfield Paradox appears in an aspect ratio of approximately 2.40:1 on this Blu-ray Disc. The movie gave us a strong transfer. At all times, sharpness worked well. Only a handful of slightly soft shots occurred, so most of the flick came across as accurate and concise. No issues with moiré effects or jaggies emerged, and edge haloes failed to mar the image. I also didn’t see any signs of source defects. Like most modern action movies, Paradox opted for the usual orange and teal palette. Though uninspiring, the hues showed appropriate reproduction. Blacks seemed dark and dense, while low-light shots – of which we found many – appeared smooth and well-defined. This became a satisfying presentation. As for the movie’s Dolby Atmos soundtrack – which downconverted to Dolby TrueHD 7.1 on my system – it provided a vivid experience. Of course, the scenes of mayhem gave us the most impactful material, as those battered us with various active elements. Music used all the speakers in a vivid manner, while various environmental moments featured the spectrum well, too. The movie used the whole soundscape well. As expected, audio quality seemed stellar. Music was bold and bright, while speech appeared natural and concise. Of course, effects dominated the track, and these elements provided excellent reproduction. All the action material showed terrific range and impact, with clear highs and wicked lows. This became a genuinely terrific mix. Two featurettes appear here, and Things Are Not As They Appear runs 14 minutes, 23 seconds. It includes comments from director Julius Onah, screenwriter Oren Uziel, director of photography Dan Mindel, associate producer Rick Carter, production designer Doug Meerdink, and actors Gugu Mbatha-Raw, Elizabeth Debicki, Daniel Brühl, Chris O’Dowd, David Oyelowo, Aksel Hennie, and John Ortiz. “Things” looks at the project’s roots and development, story/characters, sets and photography, story and characters. A mix of substance and fluff, we get enough useful content to make this a decent overview. With Shepard Team, we find a 14-minute, 48-second piece with notes from Onah, Mbatha-Raw, O’Dowd, Oyelowo, Brühl, Hennie, Ortiz, Debicki, Uziel and actor Zhang Ziyi. “Team” looks at characters, cast and performances. Much of “Team” praises the actors, but a few good notes and shots from the set make it watchable. As a mix of science-fiction, horror and action, The Cloverfield Paradox comes with ample potential for entertainment. Unfortunately, it presents nothing more than a melange of clichés and scenes stolen from other movies. The Blu-ray brings very good picture and excellent audio as well as minor supplements. Paradox becomes a tedious tale without much to make it enjoyable.